In one way, all CB radios are the same, no matter what you pay: they come standard with four Watts of power. There are three general types of radios based on their intended use, including: base stations for a fixed location; mobile radios for installation on vehicles, and handheld CBs. For the all-in-handset radio, there are only two options. The popular 75wxst is the only true all-in-handset. Also, the Midland 75-822 comes with a mobile adapter that allows it to be used as an all-in-handset radio. NOAA - The National Oceanic and Atmospheric Administration provides up-to-date weather reporting, and some radios can receive local NOAA stations. RF Gain - allows you to adjust the radio's reception sensitivity. It acts as a filter to eliminate background radio noise from weaker signals to allow more clarity for stronger signals. It's especially useful with the heavy radio traffic in urban areas. Squelch - Another way to control reception is squelch, which is included on almost all radios. You use squelch control to eliminate the background static noise between transmissions, while still permitting stronger signals to get through. ANL - An Automatic Noise Limiter (ANL) is another way to filter out unwanted weaker signals, such as AM signals, static, and engine noise. Public Address (PA) - You can use radios with this feature as a transmitter for public address systems with the CB radio, a mic and a mounted public address horn. You've heard these (hopefully only on TV) when the police officer says over the PA: "Step away from your vehicle!" Automatic 9/19 - Another feature provides convenient, instant access to the popular 9 emergency channel and 19 trucker channel. Back lit Display - Like on your TV remote control, buttons are much easier to see at night when they are back lit, so this is a convenient feature to have on the CB radio. When you've decided what features you need and want in a CB radio, another thing to consider is the size of the unit. 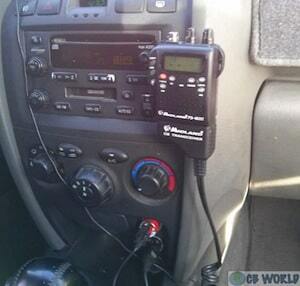 Consider the space you have available in your vehicle for your CB radio installation. Jeep and other off-road drivers have limited cab space, so they choose a more compact unit, such as the Uniden 510XL and Cobra 75 WX ST. Jeep owners. RV owners have the luxury of more space, so they can choose larger CB radios with NOAA channel reception and front-mounted speakers, such as the Cobra 18 WX ST II. CB World also carries an RV CB Radio Kit to help RV owners find the right radio for their needs. Truckers usually want all of the bells and whistles on their CBs because they spend a lot of time with their radios, so the Cobra 29 LTD is a very popular truckers' CB radio. In addition to size, there are other factors you'll need to consider when selecting the best location on your vehicle for your CB radio installation. As in real estate, finding a good location matters. Where should I mount my CB radio? Most important, you'll have to be able to easily reach your radio's buttons safely while you're driving. That means mounting the radio in or on the dash might be the best place for accessibility. You could mount it under the car seat, but then you not only wouldn't be able to reach it easily - you couldn't even see what channel you're on or any of the other functions. Also, don't mount the radio behind objects (such as the steering wheel) that would block your view, or where it will be in the way of the driver, passengers or the movement of the seats or (oops) the gearshift. Make sure that the radio would not damage an airbag that deploys. Some folks mount their radio above the rear view mirror, but then the mic cord might hang down, distracting the driver. Or, even worse, the mic could spring free, hitting the driver. So, be sure that you have a good mic mount, such as: an adhesive mic mount; or a magnetic mic mount. Be sure to mount your radio in a spot where it won't be rained on, get grimy, kicked or bumped, or have sodas spilled on it. Also, protect it from the sun, either by mounting it away from the sun or by making a UV protective cover for it. Last, but not least to many people, is mounting it where you won't have to disfigure your new or classic car with unsightly screw holes. Other aesthetics include considering the color of the radio, using a black mounting bracket for better style, and matching the radio's lighting scheme to your dash colors. CB Radio Magazine put together a helpful resource including pictures of different mounting locations. After you've made your purchase and have decided where to place your radio, you're probably wondering how to install a CB radio. Of course, you can have it professionally installed by a CB shop, but with simple tools, time and some patience, you can save money by installing your equipment yourself. Smaller radios can be installed in the dash or with the U bracket in the box. Examples of those are the PRO510XL, PRO520XL, and 18WXST. Vehicles such as Jeeps need a radio with a smaller footprint. Larger radios need to be installed with the bracket. The Cobra 29LX and Uniden BC880 are good ones. If you're nostalgic, turn to the "classic" CB look of the Cobra 29 LTD.
For a good source for DIN (in dash) radio mounting hardware, check out our mounts and brackets page. Both single mounts (for CB radios only) and double mounts (for AM/FM radios as well as CB radios) are available. Also, a lot of people seem to like the hump mounts. After you've installed your CB radio, it's time to add the antenna to the system. IMPORTANT: Do not key your mic before the antenna is installed! If you do, you risk damaging or destroying your radio! 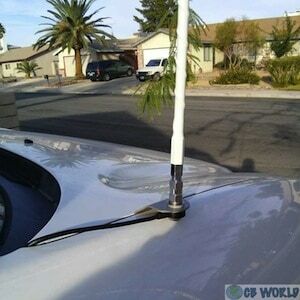 You'll find a great selection of antennas on our mobile antennas page. If you prefer a low profile antenna, the Walcott short (2 foot) antenna that looks about the same as a car antenna is available for motorcycles, pickup trucks and cars. Our Procomm JBC with tuning rings is a comparable CB Antenna. See our How to Choose the Best CB Radio Antenna page for additional guidance in selecting an antenna. On a car, the best place is on the middle of the roof - unless you have a fiberglass car or a sunroof. That way, your roof serves as the antenna's ground plane to provide good signals in each direction. 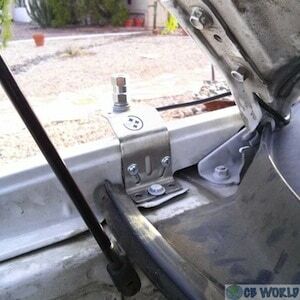 Other locations, not quite as good, include: your trunk, fender, bumper or the mirror mounts of an RV or truck. Some of these installations require holes to be drilled into your roof, trunk or fender, which require rustproofing and weatherproofing. 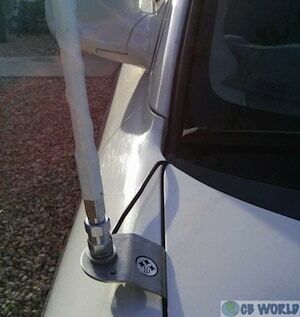 A less invasive installation can be done using magnetic mounts, but the magnet must be strong enough to secure the antenna even at highway speeds. The ground plane surface is a major consideration when deciding where to place your CB antenna. Ideally, the best place is in the center of your roof. Roof mounted antennas provide the best ground plane and a 360 degree radiating surface to transmit your signal. However, most people don't want to drill holes in the center of their roof. The next best location is to mount the antenna on the fender or trunk. Examine your vehicle to determine the best location for the antenna to be mounted where it will have the most metal surface to radiate from. Keep in mind that when you mount your antenna on the edge or side of the vehicle a 360 degree radiating pattern will not be achieved. The transmission of the signal will be limited on that side of the vehicle. Example: If you mount an antenna on the front driver side fender, your signal will not transmit well to the front right of the vehicle where the antenna has no ground plane. The signal will transmit very well to the back right of the vehicle. To achieve the best performance an antenna mounted in the fender should be at least six inches over the roof, which enables additional ground plane surface for transmission. Some antennas, including center- and continuous-loaded antennas don't include mounting hardware or cable. Others come with complete kits that include: antennas, cable and hardware. If yours doesn't come with a mounting kit, get stainless steel or weather-coated metal antenna mounts. There are a variety of mounts available. A couple of pieces of optional antenna equipment can make CB life even better: a heavy-duty spring and a quick connect coupling, such as the FireStik K1A Quick Disconnect CB Antenna Stud. People use dual antennas because they co-phase, changing the radiation pattern by forming two overlapping figure eights, thus increasing transmission strength to the front and back. This is a benefit because CB users usually want to talk to those in front or behind them rather than to quickly passing oncoming traffic. Dual antennas offer some help to signals by dividing the SWR (see " What is SWR?") in half, cutting down on transmission noise. When installing two antennas, they should be about six feet apart. To avoid reflected radio frequency (RF), they need to be no less than 1/4 wavelength apart (102"). Both antennas require sufficient ground plane, grounding, a sturdy mounting hardware and good quality coax. The performance of the antenna (and thus the radio) can be affected as much as 25% by the coaxial connection. When you consider how to hook up a CB radio, be sure to use thickly insulated coaxial cable coated to protect against the weather, such as the RG-38 or RG-58 cable, and stainless steel or metal connectors such as the Motorola type or PL-259 (which has a large connector). Otherwise, our CB Coax Cable RG8X with PL259 at Each End or CB Coax Cable RG8X with PL259 and Ring Terminals products are good choices if you prefer attached connectors (depending on your mount). If the cable is permanently connected to the antenna, you may have to snip it off and reattach it later, however we don’t recommend this because CB World will not accept a cable back that has been cut or modified. Now, how to wire a CB radio - that means that you'll need to run your coaxial cable from the antenna to the CB radio plus provide a source of power to run the radio. How you'll do that depends on your vehicle. You may need to run cable from the trunk lid through the back seat, then under the doorframe and window pillar or the dash and firewall. You have a couple of options to provide power to your CB radio: directly connecting it to the vehicle's battery or using the cigarette (aux) plug. Things to consider are making sure to have a fuse in the power line before the vehicle firewall and ensuring that your CB radio is turned off (preferably automatically) when the car isn't running. For instance, using a cigarette plug may allow the power to be always on, quickly draining the battery. To complete your antenna installation, you need to do a CB radio setup, and the logical first step is to use an SWR meter. An SWR meter, whether built-in or in a separate unit, will also help you determine where to mount your antenna. If you have a separate SWR meter or other devices between your radio and antenna, you need to use a coaxial cable jumper. The AUSWR SWR meter comes with a jumper. Your goal is to bring the SWR ratio as close to 1:1 as possible, and you can move your antenna around until you locate the best spot to install it on your vehicle. Move your vehicle to a spot with no obstructions. Calibrate your meter according to the instructions, and test the SWR by pressing the key on channel 1 and then channel 40. If the SWR reading is higher on channel 1 than channel 40, lengthen your antenna slightly (go in 1/8th inch increments); if it is lower, shorten your antenna and retest. Note that a reading of over 2:1 can damage your CB's health. Check out our video below on tuning a number of different types of antennas. This video also illustrates what to do if your antenna is too long or too short. You can save a lot of money by installing your own CB on your motorcycle using common tools you probably already have. As an example, you can purchase and modify an inexpensive, but highly rated, Uniden Bearcat PRO505XL CB radio, which comes with U shaped mounting device for a car that you can modify. You'll need an inexpensive CB antenna (such as the Midland 75822) that's designed for motorcycles, as well as a place to mount it on the rear end of your bike. Also, don't forget about the in-helmet headset. We have received some pictures from a customer who mounted a Firestik II CB antenna using a MK174 mount kit with a Midland 75-822 CB radio onto a 2004 Hyundai Santa Fe (sorry...we don't sell those!). The customer is using the 75-822 with the mobile adapter. The mount and antenna were installed on the passenger side front fender. The customer reports, "Installing on the Hyundai Santa Fe required some bending of the bracket and even then it will result it some hood contact. If the mount was slightly thinner this would be avoided." You could always ask a knowledgeable friend if one's available. 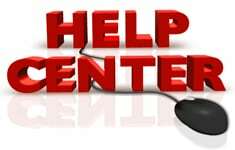 If you don't have anyone available to you can look for additional information in our technical library.